Bridging an amplifier can seem like a strange and almost “magical” concept. If you need help figuring out how to bridge an amp, then welcome! Let me help you to better understand the important basics as well as get the most power out of your amplifier. It’s easy to make mistakes and – unfortunately – you can permanently damage your amplifier and even your speakers. Don’t worry though as I’ll cover what you need to know before that happens. 1. What is car amp bridging? 7. 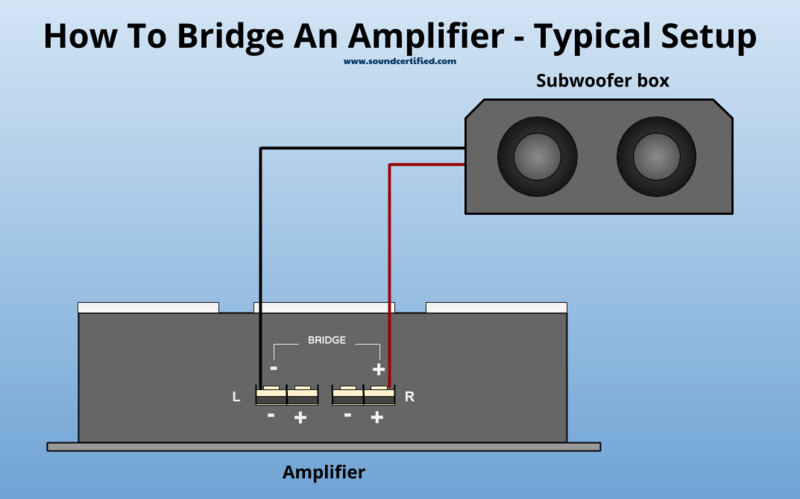 Can you bridge an amp without bridging built in? What is car amp bridging? Bridging is a special feature in car amplifiers which getting maximum amount of power out of the amplifier using a built-in channel-sharing feature. It means using 2 amplifier channels working together to drive a speaker or a set of speakers with by using power that normally is split between 2 individual amplifier channels. It’s actually a pretty cool subject, and very useful! For example, I have owned many car amplifiers and normally used 4 or 5-channel amplifiers. 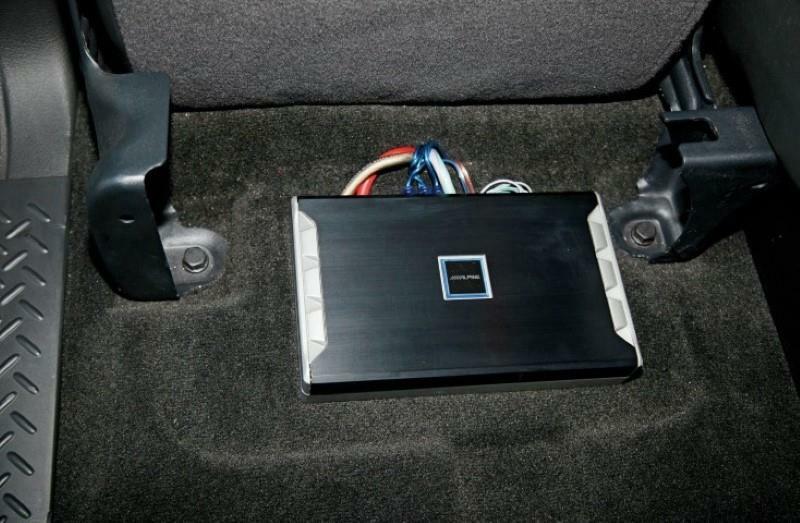 I used 2 channels, in bridged mode to drive a single subwoofer or a pair of subwoofers in the trunk. This meant having more power available at my disposal and more flexibility even if I changed my speaker setup later. How does an amp make more power? This is actually a very cool and fascinating subject. If we do the math, we’ll discover something very interesting! How about we take a real-life example and I’ll show you exactly how this works? A 2 x 50 watts/channel amplifier is connected to two 4 ohm speakers. With some math, we would find out that our little example amplifier puts out 14.14 volts when it reaches 50W into a 4 ohm speaker. We can find the power using this formula: Power (W) = (Volts x Volts) / Ohms, or P = V^2 / R.
So (14.14)^2/4 = 50W for each amplifier channel. We connect the same 2 x 50 watts/channel amplifier in bridged mode across one 4 ohm subwoofer. So by bridging the amplifier in this example, we can get close to 400W – yes 4 TIMES – the normal available power when in bridged mode, depending on the connected speaker. It’s important to remember that we’re assuming a few things, like that our amplifier is rated to provide that much power. Not all amps can deliver that much – it depends on their limitations and how they’re designed. Also note that in this mode each channel is handling several times the electrical current it had to previously. Therefore it will draw more power from the car battery. How do car amps make this possible? The reason all of this is possible is because today’s car amps have a design in which one of each 2 audio channels is actually inverted (you can also say 180 degrees out of phase) but is normally connected at the output in a non-inverted fashion. You’re normally not aware of this as it has no effect on the end user. This means that in bridge mode the bridge connection is made so that the amp channels have a difference of the available voltage at each output. This difference is twice that of one channel alone. The good news is that many car amplifiers sold today can be bridged. Note that some (especially smaller, lower cost products) may not have the feature built in so it’s very important to be aware of this when buying one. Never assume you can bridge an amp. To bridge the amp, connect the subwoofer or bridged speaker positive (+) terminal to the positive amplifier bridged terminal label, and the speaker negative (-) terminal to the negative bridged amplifier terminal also. 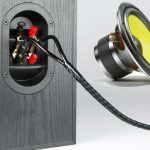 Since bridging means that much more power is now available to you speakers (more often than not this is used for subwoofers) the it’s best to use a decent quality speaker wire and make secure, tight connections on both ends. Before doing so, verify that you have met the required minimum impedance (speaker load, in Ohms) as specified on your amplifier or its instruction manual. For today’s car amplifiers this is a minimum of 2 ohms when bridged, usually. Some do support less or require 4 ohms but for best results and to make sure you are setting up your system to the best of your requirements it pays to be sure. Some older model amps and a few modern amplifiers have a “bridge mode” switch that must be used or may require only one RCA audio connection is made. Always make sure you’ve checked! As long as you have the correct speaker impedance in use (see my additional info below) you should be ready to use your bridged amplifier! Note: it may be necessary to set the built-in low-pass crossover also, if available. I’ll cover more about that below too. Note! You must be sure your amplifier can handle a bridged connection. 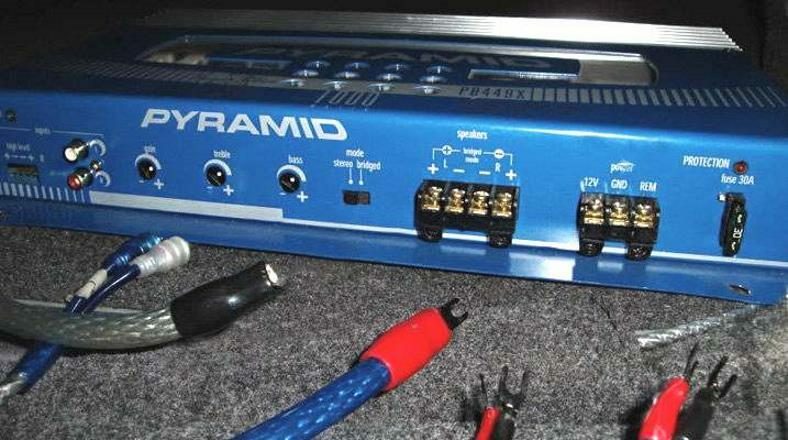 Not all amplifiers are designed to do so, and most home stereo receivers and home theater amplifiers cannot support a bridged connection. ALWAYS VERIFY BEFORE ATTEMPTING TO BRIDGE AN AMPLIFIER! See my additional information below if your amplifier does not support this by design. Your amplifier should state in the owner’s manual the minimum required “impedance” (the resistance load a speaker has) for use. This includes both for normal stereo usage as well as a rating for bridge mode too. If you cannot find the documentation anywhere a good rule of thumb for car amplifiers is to use 4 ohms. Often you’ll see the phrase “stable to 2 ohms” or something similar to describe what the amplifier can handle. 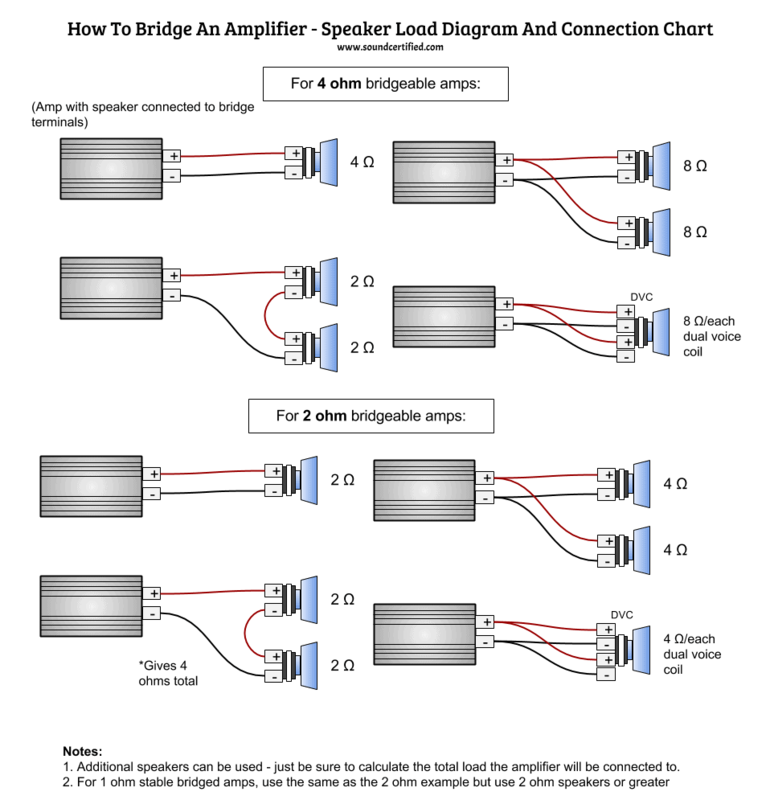 Here’s a diagram showing the most common wiring setups most people will use for typical amplifiers. For most systems, if using 2 speakers, connect them in parallel to ensure each receives the maximum amplifier power vs. connecting the same speakers in parallel. Close up of a modern typical car amp with built-in crossover features. This allows high-pass, full-range, or low-pass use with adjustable sound range controls in this case. Can you bridge an amp without bridging built in? Amps that have say they have a “tri-mode” or “tri-bridgeable” feature are simply the same as other bridgeable amplifiers with the exception that you can also keep a regular stereo pair of speakers connected while the amp is bridged and connected to a woofer or other speaker. This is normally not used by most peopls, however it does have some benefits as well as drawbacks. Bridging your amp should be a fun, easy, and enjoyable way to get more power for your money. It’s a nice way to get system flexibility as well. When it comes to amplifiers it’s important to have a good, solid wiring connection. Make your installation easy – check out this great post with the top recommended amp wiring kits for your money. If you still have any questions or suggestions about the things you’d like to see covered please let me know and I’ll be happy to help. Please help, I have 4 channel 75 watt each bridgeable amp. It has no information or switches etc, just basic layout. It says it is 2ohm stable and I want to run 4 ohm sub bridged but when I connect the way everyone describes it sounds identical. Have you any suggestions? Hi Hector. What’s the brand and model number of the amp? Also, do you mean there are no “BRIDGE” labels near the speaker terminals? Most bridgeable amps have those printed on them. Marty, I have an issue maybe you can help with. I have an 8” sub dual voice coil connecting it to a kenwood KAC-5206. I also have 4 6 1/2” Kicker 4ohm speakers I want to connect to it. Model number is CS65’s on the kickers. Is this possible and if so, how would it be done. Hello Jeff. The main issue here is that the Kenwood KAC-5206 is only a 2 channel amp. If it were a 4 channel it would be possible. The short answer? No, you won’t be able to use this one for all 5 speakers. You can, however, run 2 6.5″ per channel in parallel (2 ohms total). You’ll need to add a 2nd amp for the subwoofer in this case. Here’s one that’s pretty cheap (about $50 or below) and will work well for your 8″ subwoofer: Boss R1100M mono amp.